Perfectly healthy eggless and butterless Banana Walnut Muffins. Eggless Butterless Banana Walnut Muffins! This recipe makes 6 good size muffins.Takes around 30 minutes to prepare these tasty Muffins. These is my go to recipe when I am in a jiffy. Its a foolproof recipe.It has never let me down.I have made this recipe to a party of 6 and also to a party of 18. Its a favorite, among family and friends and also easy to bake. And baking is something I enjoy to the core, its kinda relaxing for me. It is healthy since there is no butter and its forms an excellent recipe for people who don’t eat eggs.Walnut, the king of all nuts is a source of anti-inflammatory omega-3 essential fatty acids.Its also rich in Copper, Magnesium, Iron and Antioxidants. Some pictures of Eggless, Butterless Banana Muffins without Walnuts. 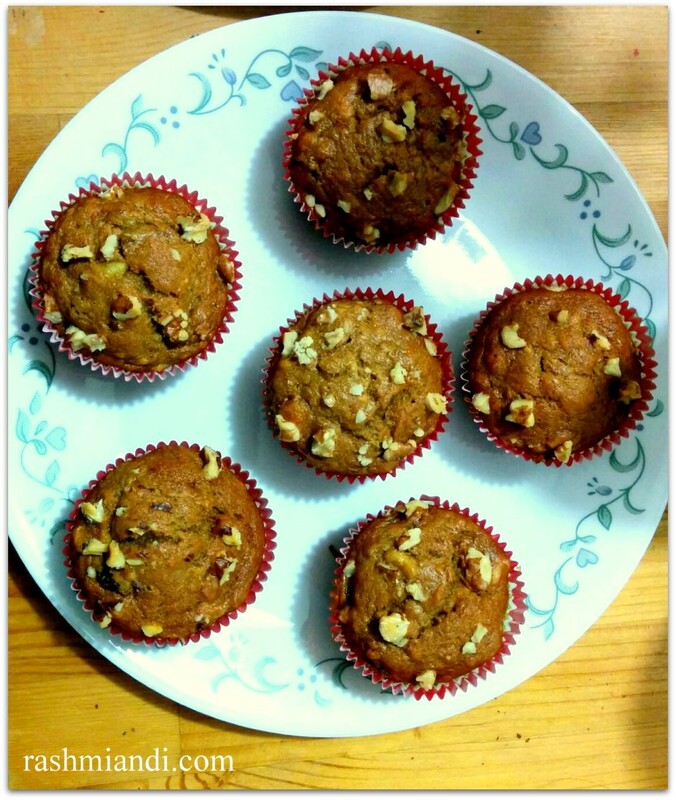 Tasty, Eggless, Butterless Banana Walnut Muffins! First take a bowl and mash the bananas using a spoon. Then, add sugar, olive oil and vanilla essence to the mashed bananas and mix nicely and keep it a side. Now add all the dry ingredients starting from Flour,Baking Soda and Baking powder and mix using a whisk so that all the ingredients are incorporated into each other. Finally mix all the ingredients. Remember always to add the dry Ingredients to wet Ingredients. Add the dry ingredients slowly. Then mix all the ingredients using a baking spatula. Remember not to overdo the mixing. Mix just to incorporate all the dry ingredients into the wet ingredients. Add 1/4 cup of walnuts to the batter and mix it gently . Keep the remaining to sprinkle on the top. Line the muffin tray with muffin paper liners and fill it with batter upto 3/4 or 90% of it. It will raise, so make sure you leave that space. Now sprinkle remaining Walnuts on the top. Place the tray in the preheated oven at 375 F and bake for 30 minutes or until the tooth pick is inserted and it comes clean once you remove it. Mine took around 27 minutes. Baking time may change as per the flour and other ingredients we use, so start checking after 23 minutes using a toothpick. Don't forget to Preheat the oven to 375 F first. Try to use ripe bananas,the flavor is enhanced when you use ripened bananas. Add dry ingredients to wet slowly. Keep an eye on you muffins when they are baking after 23 minutes. Keep checking with a toothpick. Once baked remove the tray from the oven and let it cool.